Some teachers have told me that on occasions people who manage schools have told them that they shouldn’t just be letting children read to themselves, and/or they shouldn’t just be reading and enjoying poetry. The teachers need to be doing some specific teaching and the children need to be doing a set task. In this blog, I’m going to try to answer this. I’m going to defend the activity of reading and enjoying poetry in the primary classroom. Just that. No task. This involves me imagining a situation in which a teacher has to justify this in a meeting with someone who is telling that teacher that there is little or no point in simply reading and enjoying poetry. via Michael Rosen: Poetry in Primary Schools 2.. The Siobhan Dowd Trust will this year offer a £1,000 monthly grant for schools to spend in local bookshops. The grants are open to any schools or organisations that work with disadvantaged young people and the money must be spent on children’s or YA books in local bookstores. Instead of organising the grants by region, like last year, the trust will give one grant a month to any school in the UK. The winner of January’s grant will be announced on 1st March. To enter, schools must email the trust with information about what they do encourage their pupils to love reading, as well as “demonstrate disadvantage”. via New school grants offered by Siobhan Dowd Trust | The Bookseller. Robin Stevens announces that in response to pressure of work she will not be undertaking school visits for the foreseeable future. A FAQ at the end of the blog post confirms that she will honour all existing arrangements and will still be participating in other promotional events. I’ve got Book 5 to finish by the end of June, and then a lot of exciting projects (more about these very soon, I promise!) to work on before the end of the year. I have to admit defeat – I can’t write these books and do as many events as I’ve been doing. I am not actually magic. And that’s why, with heavy heart, I’ve decided to close to school visits for the forseeable future. via Robin Stevens | Blog. Sales of children’s books are at an all-time high, yet it is harder for publishers to reach young readers, says the owner of a literary agency that represents more than 200 children’s illustrators and writers. Vicki Willden-Lebrecht, founder of London-based The Bright Group, said funding cuts at schools and libraries has meant there are fewer books than ever on display, making it harder to reach families that do not normally buy books. Sales of children’s books in the UK – including e-books and other digital formats – increased to £349m in 2014, a rise of 11pc on the previous year, according to recent figures from the Publishers Association. That contrasted with a 2pc decline in overall book sales. via Boom time for children’s books as sales soar, but where are readers? – Telegraph. The Siobhan Dowd Trust is delighted to announce an increased number of winners for the School Library Competition for 2014. 8 schools will get cash awards of £500, while another 4 will getawards of £1,500, £3,000, £3,000 and £6,000. Kate Powling, Director of the Trust said: “We were pleased to get so many entries for our school ibrary competition, but shocked at how much need the entries demonstrated; it seems there are lots of libraries in schools without rooms, librarians, and in some cases books”. The winners were announced this evening at the Schools Library Association conference in Manchester, and a local school Light Oaks Junior School in Salford won the top prize. The Library at Light Oaks has suffered an arson attack and a flood so the Judges felt it was time to attempt to reverse their run of bad luck. In their winning application, teacher Hannah Burke wrote “On reading of your exciting competition, I was bursting with enthusiasm to enter as I believe our cries for help have been heard. The desperate need for money to re-establish our library has been felt by all the staff, pupils and parents of our school”. This years Judges were: Tony Bradman (Author and Chairman of the Siobhan Dowd Trust), Carol Webb (the Librarian at Forest Hill School, South London & the SLA School Librarian of the Year 2011), Charlotte Hacking (Teaching and Learning Manager at the Centre of Literacy in Primary Education) and James Dawson (ex-Primary teacher, YA Author and Queen of Teen nominee). The Siobhan Dowd Trust is a charity that was set up by the Author Siobhan Dowd to use the royalties from her books to fund reading projects for disadvantaged young readers. 14. Buy new marker pens. Every author knows the feeling of discovering on-stage that a pen’s a dud. Three test swipes of a used pen won’t always reveal which ones will work for more than a minute. An author visit is a big deal; invest in a pack of new markers, they don’t cost that much. Make sure you have enough flip chart paper if the author wants a flip chart, and check that the flip chart stand isn’t broken. 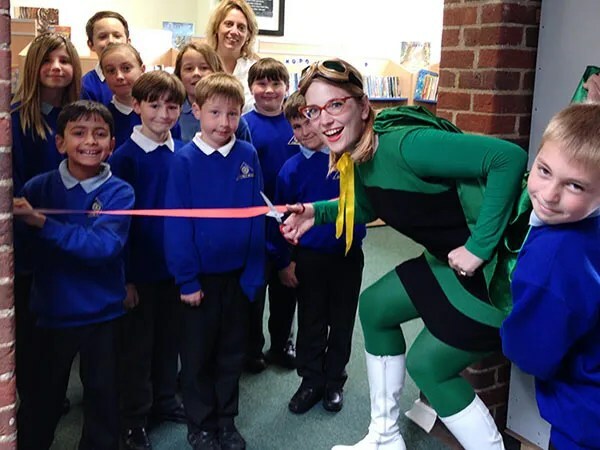 via Sarah McIntyre – 25 tips for hosting an awesome author visit!. Gary Northfield (London), David O’Connell (London), Elissa Elwick (London), Gillian Rogerson (Leeds), Anne Cottringer(Hereford), the Etherington Brothers (Bristol), Jamie Littler (London), Laura Ellen Anderson (London), Neill Cameron (Oxford),Jim Medway (Manchester), The Phoenix Comic authors, Sally Nicholls (Oxford), Patrice Aggs (Brighton), Liz Pichon (Brighton),Guy Parker-Rees (Brighton), Steve Cole (Buckinghamshire), James Mayhew (Hertfordshire), Alex T. Smith (London), Philip Ardagh (Tunbridge Wells), Alex Milway (London), Lauren St John (London), Kjartan Poskitt (York), Fiona Dunbar (London),Candy Gourlay (London), John Dougherty (Gloucestershire), Adam Stower (Brighton), Layn Marlow (Surrey), Jo Cotterill(Buckinghamshire), Garry Parsons (London), Ed Vere (London), Lizz Lunney (Birmingham), Laura Howell (Birmingham), Asia Alfasi (Birmingham), Juliet Clare Bell (Birmingham), Jon Mayhew (Wirral Peninsula), Moira Young (Bath), Jeff Norton (London),Caryl Hart (Derbyshire), Emma Vieceli (Cambridge), Chris Priestley (Cambridge), Woodrow Phoenix (London/Cambridge),Mary Hoffman (Oxford), Meg Rosoff (London), Francesca Simon (London), Nana Li (London), Lucy Coats (London), Garen Ewing (East Grinsted), Bali Rai (Leicester), Bridget Strevens-Marzo (London), Mo O’Hara (London), Keren David (London),Damian Kelleher (London), Anthony McGowan (Leeds), Helena Pielichaty (Nottinghamshire), Ali Sparkes (Southampton), Ian Beck, Jamie Thomson, Children’s Laureate Malorie Blackman, Andy Stanton, Nicola Davies, Saviour Pirotta, Tony Bradman,Nicola Smee, Michaela Morgan, Caroline Lawrence, Laura Dockrill (London), Anne Rooney, Kate Hindley, Shoo Rayner,Gillian Cross, An Vrombaut, Anthony Browne, Catherine Johnson, Michael Rosen, Mei Matsuoka, David Almond, Steve Lenton, Emma Dodd, Kelly Gerrard, Teri Terry, Chris Riddell (Brighton), Paul Stewart (Brighton), Jonny Duddle, Polly Dunbar,Leigh Hodgkinson, Hannah Marks, Anita Loughrey, The 2 Steves, Chris Mould, Frances Hardinge, Alan Gibbons, Holly Smale,Tim Bowler, Jackie Marchant. Schools to be offered National Literacy Trust classroom pack tie-in for Anthony Horowitz live-streaming event in June. The paperback edition of Russian Roulette is published by Walker Books on 5 June. Walker Books and the National Literacy Trust will this June livestream Anthony Horowitz talking about Russian Roulette, the latest book in the Alex Rider teenage spy series. The event will take place 16th June and will be hosted by TV presenter Barney Harwood. Horowitz will also answer questions sent in from the audience. The National Literacy Trust has created a special Russian Roulette classroom pack for schools taking part, including "White Carnation", an Alex Rider short story. via Walker to livestream Horowitz event | The Bookseller. In my school library I worked with so many different teenagers; Year 11 girls who had never read for pleasure before finding books that represented their school experience, with one particular convert refusing to let her friend watch "Made in Chelsea" until after an impromptu book club. I worked with groups of struggling Year 7 students who were re-engaged with books by having Wonder read aloud to them. There were the Year 10 girls who joined in with the sixth form Man Booker prize shadowing club, the Carnegie shadowing group and the queues of students lining up to get books signed by Patrick Ness or Henry Winkler. There was a never-ending stream of students who found solace and comfort in the library, not to mention somewhere to play Dungeons & Dragons. They also have small budgets and are often reliant on SLSs to maintain collections that can support their schools. SLSs are an invaluable resource, organizing training and advocacy, as well as resources. They are an irreplaceable loss, especially for primary schools where budgets are even smaller, or non-existent, and frequently without a dedicated librarian. The closure of SLSs limits the number of children that can be helped and inspired by libraries. SLSs are dependent on funding from their council, and councils are currently being forced to make unrealistic financial cuts to their arts and culture provisions by the government. A government that refuses to make school libraries statutory and repeatedly demonstrates the lack of value it places on the arts. School libraries open minds, eyes and hearts but they need the support of their schools, councils and fundamentally the government. When school libraries are gone, due to ‘unavoidable’ cuts, we will realise what we have lost. Without a school library, and librarian, where will children go to explore, question, learn and wonder? Libraries are an equaliser and I believe a child who has had access to a properly staffed and equipped school library is less likely to need access to a prison library. via A school library is an equaliser | The Bookseller.